I've heard of SweetWater on a number of occasions, but of course here in San Diego their beers aren't easy to find. Sources (i.e. Brendan) tell me that Atlanta Brewing Company is better, but I don't have any of their stuff yet, I have this one. Anyway, back to the task at hand. The website and bottle also claim, 'This is the beer you've been training for'. I'm, um, skeptical. It also says this beer was named 'Best IPA in the Country'- by the Atlanta Journal-Constitution. I love me some home cookin'. The beer looks pretty malty on sight, and it lacks the oily, sticky-looking head that I usually associate with IPA. The nose isn't really malty at all, though- it's more sweet, with a good thump of hop bitterness. It's also got a slight ammonia note that's a little odd, though that fades as it sits in the glass (thankfully, because it made me recoil a little bit initially). The flavor also has nice hop bitterness, but the malt has moved towards the sweet end, and if you've been following the drivel I've been spewing out for the past month or so, that's not really my favorite thing. However, the sweetness isn't cloying, and in the end, the hops win the war. In the end, I don't mind this too much. 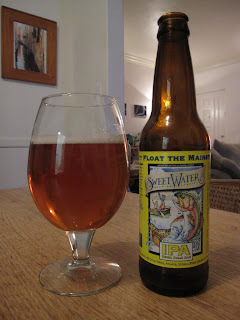 I'm glad the malt plays second fiddle, and it's got a pretty hefty hop load, which shows me that SweetWater is taking hops seriously as a lead actor and not just part of the supporting cast. If I lived somewhere in the South and didn't have easy access to Racer 5 and Big Eye, I'd probably consider putting this into my beer rotation. But, alas, that's not the case, so I guess I'll have to just keep drinking those two. Life is tough.